The Central Election Commission (CEC) conducted a session chaired by Mazahir Panahov on April 15, 2018. The issue on the finalization of the Presidential Elections of the Republic of Azerbaijan held on April 11, 2018 and submission of the CEC protocol on voting results and relevant documents to the Constitutional Court for approval was considered at the session. CEC Chairman Mazahir Panahov noted that on April 11, 2018 the Presidential Elections of the Republic of Azerbaijan that was held freely, fairly and transparently has turned a historical event of great importance in the socio-political life of the country. CEC and relevant state bodies have focused on the execution of the duties and competencies implied by the Election Code to prepare and hold elections effectively. Important stages of the election process - the update of voters’ lists, improvement of normative legal framework, awareness-raising of all electoral stakeholders, including voters, nomination and registration of candidates to presidency, facilitating equal pre-election campaign, providing observers and media representatives with free access and all other activities were undertaken in accordance with the Calendar Plan compiled and approved by CEC. Having underlined the special importance of the presidential elections in every country, Mazahir Panahov stated:”The elections monitored by nearly 900 international observers, also mass media representatives from 51 prominent international media outlets turned a glorious page in the history of Azerbaijan. The main aspect here is the great interest of the all groups of civil society in the elections. Along with the political parties the candidates of which have been registered, other political parties also observed the elections. Therewith, those who intended to join the monitoring of the election on own initiatives had also been registered. All these indicate the great engagement of the civil society groups in the elections. It is a gratifying case that almost the majority of the international observers who monitored the elections stated on the top-level preparation and conduct of the elections”. The Commission Chairman informed on the registration of the candidates in compliance with the Election Code and stated that 8 nominees were registered – 6 by political parties, one on own initiative and one by the voters’ initiative group and all of them were provided with equal terms and opportunities for pre-election campaigning. Pursuant to the Election Code, totally 168 venues, 84 of which were indoor and 84 were outdoor areas were given to the presidential candidates’ disposal and only upon informing the Constituency Election Commissions, they used those venues free of charge to manifest their platforms for voters independently. More than 10 thousand billboards were installed in all the polling stations for candidates’ pre-election campaigning. For providing the presidential candidates with broad and effective pre-election campaign opportunities as implied in the Election Code, Public TV and Radio Broadcasting Company allocated free airtime of 6 hours a week (3 hours in TV and 3 hours in radio) – two times more than the time limit enshrined in the legislation; "Azerbaijan”, "Khalg gazeti” and "Bakinskiy rabochi” newspapers allocated free space for publication and all candidates benefited from these opportunities. Furthermore, the price list for payable airtime offered to candidates by 34 media outlets was submitted to CEC, the information was posted on the Commission website for candidates’ familiarization. The pre-election campaign started since 19 March lasted up to 10 April and generally, was being held within the atmosphere of civil and modern requirements. Mazahir Panahov stated:”Regarding the Presidential elections, a broad education campaign was held for voters apart from all the election stakeholders. One hundred thousands posters in more than 52 different types on the date of elections, voting procedures, as well as guiding and calling to elections were published and displayed within the all residences; a number of public service announcements on similar topics were daily broadcasted in TV and radio including the voting day”. It was mentioned that different projects were carried out for the handicapped voters to vote independently like all other voter groups. By using the stencils prepared for them which contained the information of the ballot paper in Braille alphabet, the visually disabled voters could vote for any candidate they wanted freely and independently on the Election Day. Therewith, mobile ramps were used for the voters with mobility impairment to come to the polling station to vote. The researches determined 1455 polling stations settled by the voters with mobility impairment, such voters in those polling stations were facilitated to vote by installing mobile ramps. Thus, all polling stations were provided with available opportunities for the handicapped voters. For the awareness-raising of the voters with hearing disabilities, a video clip with detailed voting procedures in subtitles was prepared within the voter education program by CEC, thereby contributing to the awareness-raising of such voters. CEC Chairman informed that the Presidential elections were observed by 894 international observers representing 61 international organizations and 59 countries. Therewith, 118 international media representatives from 51 prominent international media outlets monitored the elections upon accreditation by CEC and being provided with a relevant badge. Alongside with all these, 4 organizations conducted "exit-poll” in the elections, 2 of which co-organized their activity with the US and France organizations and the results of "exit-poll” almost coincided with the CEC official results. Representatives of local mass media functioning within the republic participated in the elections from the beginning to the end of the election competition freely and independently without being required any additional registration and document. Nearly 58175 domestic observers representing a number of political parties, civil society institutions, registered candidates, also those who participated in elections on own initiatives conducted observation in the elections. Generally, both domestic and international observers, also local and international media representatives were provided with free access to implement their activity freely and independently during the preparations to elections, voting day and the proceeding periods. Mazahir Panahov stated that apart from all the above-mentioned steps taken for ensuring transparency in the Presidential elections, webcams were installed in 1000 polling stations (approximately in 20% of the polling stations where elections are held) that cover the whole territory of the republic, which allowed to follow the voting process lively via internet. "I express with great gratification that any unlikable case was not recorded in their activity. It was possible to follow all the processes incessantly from the start of the voting to the end of the elections. Internet users were able to monitor all the procedures in the polling stations lively either through the CEC website without any registration both within the country and abroad. I believe that the election-related standards applied in Azerbaijan could be an example for the international community”, - Commission Chairman emphasized. It was mentioned that vote counting was being conducted incessantly after the polling stations had been closed on the voting day. Preliminary voting results were publicized for local and international community to get familiarized with the election results within 4 hours after the voting ended - at 23.00 basing on the data received from 3675 (65,15%); - at 01.00 on 12 April from 5201 polling stations (92,20%) out of 5641 polling stations. Final voting results protocols and other election documents were delivered to Con.ECs by PECs and from there to CEC within the period defined by law. He noted: ”Voters expressed their will freely and independently in polling stations and in general, 74,30% of voters’ total number participated in the voting on the Presidential Election Day. CEC and lower election commissions have not filed any complaint throughout the election campaign including the E-Day and the proceeding days. The enquiries entered the hotline # 115 and electronic hotlines of the Commission by voters related to the addresses of polling stations, voter lists and other similar questions were responded immediately and necessary steps were put for effectively”. CEC Deputy Chairman Natig Mammadov took floor at the session and informed that the Commission had put all necessary steps for the conduct of fair and transparent elections. He stated: "All international organizations, even the most biased organizations do not make doubts about the professionalism of the Central Election Commission. The studies held under this professionalism show that there were some attempts to overshadow the effective election environment. All the received protocols and information posted on the internet resources were investigated. Webcams perceived as the leading practice of Azerbaijan contributed further to this work. 5 days’ investigations found out the irregularities which did not allow determining voters’ will in several polling stations”. In this regard, N.Mammadov proposed to invalidate the voting results of the PEC # 2 of Kurdamir Con.EC # 57, PEC # 10 of Lankaran city Con.EC # 73, PEC # 26 of Jalilabad-Masalli-Bilasuvar Con.EC # 69, PEC # 12 of Lankaran village Con.EC # 74, therewith to dismiss the full composition of the PEC # 2 of Kurdamir Con.EC # 57 and PEC # 10 of Lankaran city Con.EC # 73. The works towards the determination of general results of the Presidential Elections were finalized, CEC final protocol on the voting results was compiled and approved upon signature by the Commission members at the session. Pursuant to the Election Code, a decision was adopted to submit the CEC Protocol on general results and relevant documents to the Constitutional Court for approval. Meanwhile, the voting results of the PEC # 2 of Kurdamir Con.EC # 57, PEC # 10 of Lankaran city Con.EC # 73, PEC # 26 of Jalilabad-Masalli-Bilasuvar Con.EC # 69, PEC # 12 of Lankaran village Con.EC # 74 were invalidated and the PEC # 2 of Kurdamir Con.EC # 57 and PEC # 10 of Lankaran city Con.EC # 73 were dismissed in full composition. Later the Commission members who made speech appraised the steps and projects carried out as an important and esteemed event for the conduct of free, fair and transparent elections, thereby stating that the voting results expressed the people’s will. 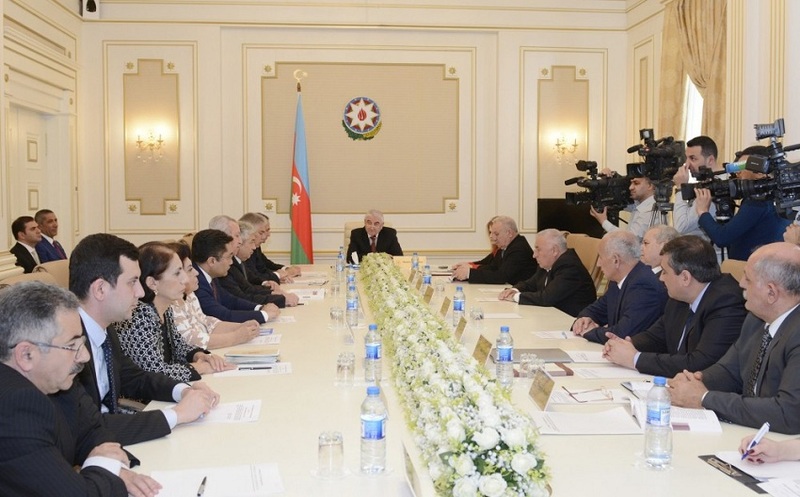 Having noted on the top-level preparation and conduct of the elections, Siyavush Novruzov, Deputy Executive Secretary of the New Azerbaijan Party, Chair of the Milli Majlis Committee expressed his gratitude to the Central Election Commission. He also stated that the election process was held in compliance with the legislation requirements. CEC has put all steps for the conduct of elections transparently and fairly. The CEC session was broadcasted broadly by local and foreign mass media.